Tesla Model 3’s ‘Black & White’ interior comes with white seats that are stain resistant — but the level of their stain-resistance was yet to be tested on an extreme level i.e. spilling ‘red wine’ on them and wiping them off, you need the heart of a lion to do that to your luxury electric sedan (test video below). Black and White Interior is our most durable option available, made with easy-to-clean, stain-resistant material. Last month Elon Musk claimed in a tweet that the Model 3 white seats are extremely stain-resistant to a level that you can spill red wine on them and just wipe off and the seats will be like nothing happened. The white seats are actually extremely stain resistant. You can spill red wine on the seats & just wipe it off. Our friend Vincent who usually reports developments related to Tesla’s activities in China took this challenge seriously and intended to record the test while he’s at it. We took two screenshots from the video one when the wine was spilled on the Model 3’s white seat and the other when it was wiped-off to see if any stains remain, but they don’t, do let us know if you see a stain in the comments section below. Wiping-off took less than a minute and the Tesla Model 3 white seat was just like before in no time, thanks to team Tesla for coming up with a high-quality stain resistant material. Also, Tesla Model 3 white seats are made of ‘Ultra White synthetic leather’ that does not include any animal products, making it a full vegan material. 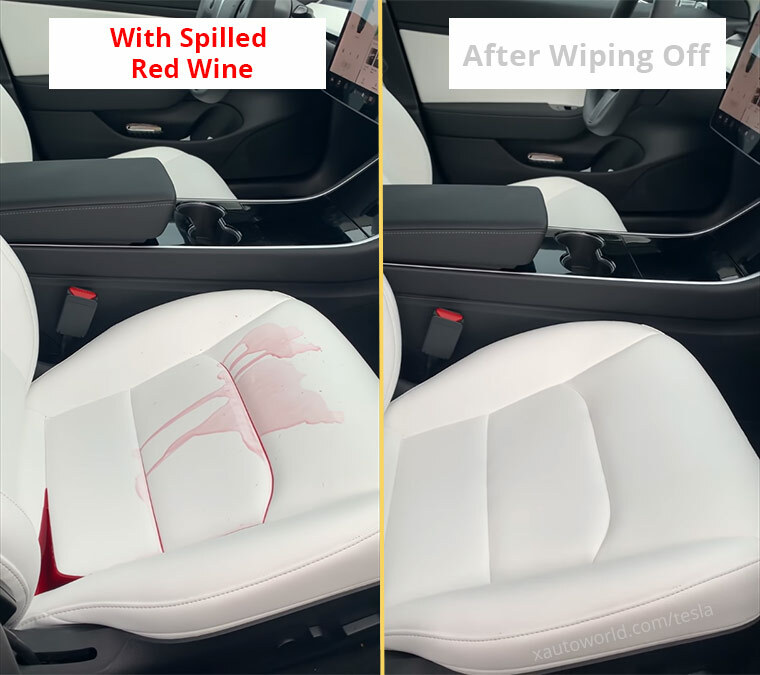 Comparing Tesla Model 3 white seat with spilled red wine and after wiping off the liquid. 1- Wipe spills as soon as possible using a soft cloth moistened with warm water and nondetergent soap. Wipe gently in a circular motion. Then wipe dry using a soft, lint-free cloth. Vacuum the seats as needed to remove any loose dirt. 2- Never store large amounts of liquid in Model 3. A significant spill can cause electrical components to malfunction. Let’s watch Vincent perform the test, we salute his courage in doing so, as he got his Tesla Model 3 only a month ago.